INFORMATION SESSIONS ARE HAPPENING TODAY! Come to an information session to learn more about the position, the application and interview process, as well as tips on how to successfully go through the application and group interview process from our very own Welcome Week Leaders from this past Welcome Week! GET INVOLVED. FIND YOUR COMMUNITY. LEAVE YOUR LEGACY. 1. I’m currently studying away – can I still apply? Yes! You can still submit an application. On the application, there is a place to indicate you are studying away and we will schedule a skype interview with you. 2. What is the selection process like? Apply for the position at this link by Sunday, March 17 @11:59pm EST. You will be notified if you are invited for an interview by March 20. All applicants will be notified of the decision during the week of April 1st. 3. It doesn’t seem like my vibe. The WW Leaders all seem extroverted. Would I fit in? Some of our leaders love dancing on the Kimmel stairs to hype people up and some of our leaders prefer one-on-one conversations with new students nervous about starting college. Whether you’re hype or chill, we’re looking for student leaders who want to make an impact on new students. We truly believe that anyone can be a Welcome Week Leader. 4. How available do I need to be as a WW Leader? It is mandatory to participate in the WW Leader Training that occurs Wednesday, August 21-Friday, August 23 from 9am-6pm on campus. During Welcome Week (Sunday, August 25 – Saturday, August 31), you must have flexible availability as you will be assigned to work at least four 5-hour long shifts for the exciting events going on. 5. Can I be a WW Leader and an RA/CA/TA/School Orientation Leader? Because of time conflicts with training and new student preparation, you are not able to serve in both the Welcome Week Leader and RA/CA/TA roles at the same time. The ability to serve as both a School Orientation Leader and Welcome Week Leader varies by school. If you are interested in any of these positions, we suggest going through the application process for all of them and you can let us know later which position you select. 6. Is there any compensation for the Welcome Week Leader position? The Welcome Week Leader position is completely voluntary, although all meals will be provided during training and during each of the 5-hour shifts you are assigned. For all students living on campus in Fall 2019, you will be able to move-in early to your room. If you are a Welcome Week Leader for one year and apply for an elevated position the following year as a Captain or Chair, then there will be a stipend for these positions. The NYU Entrepreneurs Festival is a 2 day celebration of the NYU startup community. We host 1000+ attendees total, plus over 100 speakers, 60 startups exhibitors, 21 roundtables, 9 panels and workshops, and 4 keynote speakers! Tickets also include access to the after party and the pitch competition. The event is open to non-NYU people as well, but current and past NYU students get the best deals (of course!). The 2019 Peer Mentor Application is live! Calling all NYU Steinhardt undergraduates students looking for an amazing leadership opportunity for next Fall! Applications are now available for the Steinhardt Peer Mentor position. Peer Mentors serve as role models for incoming first-year and transfer students, and are responsible for engaging and supporting new students in their departments after they arrive on campus. 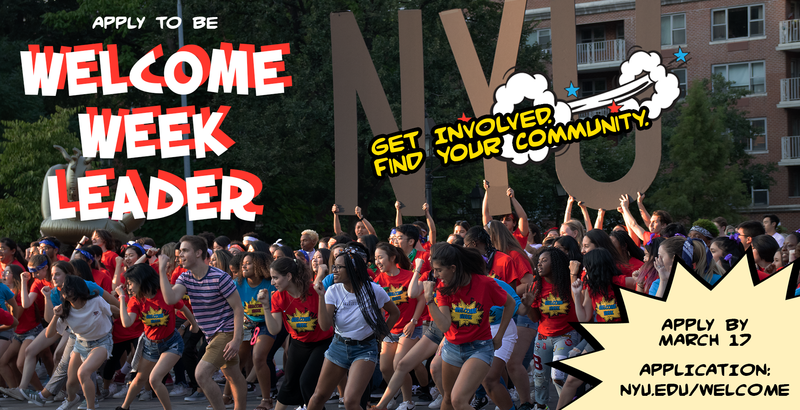 This includes participating in NYU Welcome Week activities, New Student Seminar, office hours for 1:1 appointments, and other departmental programs. Peer Mentors are responsible for co-facilitating a section of New Student Seminar with a departmental advisor or instructor in the fall. Candidates for this position must have excellent communication skills, desire to serve as a leader and role model, and ability to engage new students in a responsible and professional manner. Find out more about the position & application process by visiting our website. Join us for an Information Session where our staff will discuss the position and answer your questions. You must attend an Information Session for your application to be considered. The application deadline is Friday, February 22nd at 12pm. For more information, please feel free to contact Justine Kelly-Fierro at justine@nyu.edu or by calling the Office of Student Affairs at 212.998.5065. Are you interested in refining your college and career path with the support of expert professionals? Do you want to be a changemaker in your community but don’t know how to start? Then, the Leadership Initiative Mentoring Groups are for you! The deadline to apply is 11:59PM EST, January 27th, so get started now! The American Educational Research Association (AERA) is pleased to announce the AERA Undergraduate Student Education Research Training Workshop. The workshop, led by junior and senior scholars, will give fellows an overview of how education research is designed across fields, how quantitative and qualitative research methods are used in studies, and how research is applied to education policy and practice. Senior researchers and faculty from both academic institutions and applied research organizations (i.e., The American Institutes for Research, Educational Testing Service, the College Board, and the Urban Institute) will introduce education research as a field and share their area of expertise and knowledge with the fellows. In addition to attending the workshop and participation in the poster session, fellows will attend pre-selected paper sessions and presentations during the 2019 Annual Meeting in Toronto, Canada. Fellows are required to participate in all Workshop events and the invited poster session during the 2019 AERA Annual Meeting in Toronto, Canada. Where to Apply: AERA will accept applications via the AERA Undergraduate Student Education Research Training Workshop online application system. All materials must be received by 11:59 p.m. (PST) on Thursday, January 10, 2019. Direct any questions about the fellowship program, eligibility requirements, or submission process to George L. Wimberly, Director of Professional Development, at 202-238-3200 or fellowships@aera.net. AERA, founded in 1916, is concerned with improving the educational process by encouraging scholarly inquiry related to education and evaluation and by promoting the dissemination and practical application of research results. AERA shares the products of scholarly research with peers, future educational researchers, practitioners, policymakers, and the public through its annual meeting, publications, and professional development activities. Steinhardt School Spirit comes in many shapes, forms, and colors. Visit the NYU Book Center for Steinhardt tee shirts, polos, hoodies, drink ware, and auto accessories. Steinhardt is there! And, just one of the many ways we shout our Steinhardt pride!